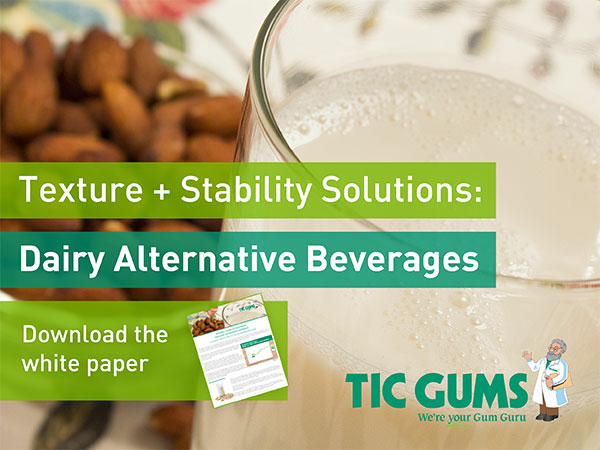 Gellan gum, used either alone or as part of a complete beverage stabilizer system, is an attractive option for beverage developers seeking to appeal to consumers who are interested in indulgent but still clean-label foods. While the definition of clean label varies widely, gellan can be considered to be all-natural*, organic compliant and non-GMO*. High acyl gellan gum is especially useful because it forms fluid gels even at low usage levels. This weak gel structure creates a network with exceptional suspension capacity without appreciably increasing the viscosity or changing the mouthfeel of the finished beverage. This property is what makes gellan gum an excellent choice for preventing separation in ready-to-drink protein beverages and suspending particulates like fruit pieces or pulp or minerals and vitamins. Gellan gum hydrates at temperatures commonly reached during UHT/HTST processing, without requiring additional manufacturing steps. While gellan gum solutions thin when heated, they quickly regain their viscosity once the solution cools to the necessary temperature. Gellan gum is relatively tolerant to variations in the levels of protein typically found in fortified beverages and is suitable for use in beverages formulated with dairy alternatives and plant-based proteins like soy or almond milk. Our Gum Gurus are always available to help you select a stabilizer that meets your specific needs. You can reach them via our technical service hotline (800) 899-3953/+1 (410) 273-7300 or online chat.